video biography & celebration videos, tributes and memorials, oral histories, photo restoration & quality film transfers. Interested in celebrating a life by recording personal & family history on video in attractive & entertaining ways? Have a birthday, reunion or anniversary coming up? The passing of a life is a call to celebrate their precious time with us. We specialize in personal and tribute video for all occasions - the happiest to the very saddest. Apple "Certified Pro" video editor and an enviable record of on-time delivery of creative documentaries and web video where interviews are a key component. "The best elements of great movie making - intimacy in the storytelling, gorgeous videography, seamless editing, impeccable narration, and a cohesiveness, timelessness and class usually reserved for major Hollywood productions." A unique gift: Celebrate a life with a video biography, family history video, personal history video, video memoir or legacy video from award winning Your Story Here LLC. We have delighted hundreds of customers & their families and friends with our careful and caring video production and video editing work in our video biographies, family history videos, personal history videos and video memoirs. 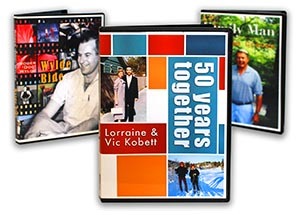 We create "A&E" style video biographies, legacy videos and family history films along with veterans' video, video memorials, life story & genealogy video, personal history videos and other biography projects on DVD, Blu-ray, USB, or for posting to the web. We conduct oral history interviews and "Storycorps" inspired audio recordings (not affiliated with Storycorps or NPR). Perfect for birthdays, anniversaries, reunions, graduations, memorials and as a gift. We copy, restore, repair and enhance old photos and documents. We interview in your home. We also film occupations and interests. We combine the footage with your photographs and documents. We add captions to photos. We select archive footage and images. We add music, chapters and a DVD menu. 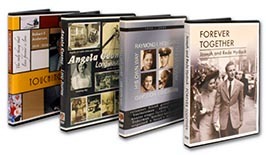 We design a personalized and unique DVD box slip cover for your video biography or family history video. We take pride in delivering video biography, family and personal history video and video memoir projects that will be treasured for generations!